Some types of games are timeless. Such is true of the tried and true run and gun. It triggers warm memories of classics like Contra and Mega Man. The developer of the Gunman Clive games on 3DS/WiiU is back with their third game, similar in nature but somewhat larger in scope. 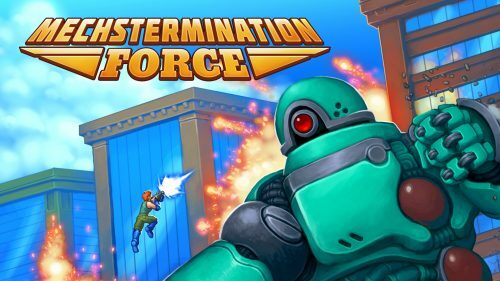 How does Mechstermination Force fair in a crowded 2019 landscape? The graphics in Mechstermination Force are really striking and a huge positive. It’s a 2.5D side scroller, with polygon graphics set on a 2D plane. The art is vividly colored with bright, solid colors throughout. There is almost a painterly look to the characters, and especially the gigantic enemies. Mechstermination Force is a 2D side scrolling run n gun game, in the same vein as Contra or Metal Slug. It seems close to Contra at first glance, with a series of weapons that seem to closely mimic the clasic Konami series, including a spread gun, flame thrower and laser. And while the game does feature jumping and shooting, there are no levels in the traditional sense. Instead the game presents 14 missions to beat giant bosses, one at a time. This is somewhat similar to how Cuphead is broken down. There is a hub that allows the player to buy upgrades and listen to game music, as well as enter any of the missions. It’s a polished, graphically impressive run n gun with HUGE boss battles that border on too hard. Mechstermination Force builds on the Gunman Clive series into a bold new direction, but still held back by somewhat floaty platforming. However, small faults aside, it’s a fun game and recommended to fans of the genre. Join the Mechstermination Force and save the world from the gigantic MegaMechs! Battle against massive bosses, jump and climb onto them to find their weakspots and blow them to kingdom come in this action packed platforming boss rush, from the creator of the Gunman Clive series. When the MegaMechs have taken control of the world, one small group of brave soldiers are still fighting for humanity’s independence. Join them and lead the charge against the mechanical menace.